Ben Williams was 4 when he entered Nevada’s foster care system with his 1-year-old brother, Andre. Sons of a prostitute addicted to drugs, the toddlers became wards of the state. A life of heartache and abuse lay ahead. Thirty-three years later, Williams is the role-model principal at Ron Brown College Preparatory High School in northeast Washington, D.C., and the holder of three degrees from the University of Virginia. Those difficult, early years seem to have predestined him for the responsibility and are probably why he so easily relates to the students at the new, public, all-male, college preparatory high school, the only such academy in the nation’s capital and one of just a few in the country. On this Wednesday morning at 9, Williams is standing stock straight in the school lobby, as he does every school day, greeting students by name with a handshake, hug or pat on the back. “Jackets on. Tuck in your shirttails, young men,” he says. Like Williams, some of these young men have seen hardship. They’ve experienced trauma. Some were dealt a bad hand. But they persevere. “I wanted to really address young people who have struggled, experienced trauma, are foster care students and students who have been adopted; to give them a space they can work in, be encouraged and feel loved while pursuing their academic dreams,” Williams said later that morning in his office, its walls covered in whiteboards scrawled with to-do lists. Williams has a calm presence, soft eyes and a quiet baritone voice. He talks candidly about his journey, about his struggles to overcome staggering odds, and he speaks movingly about the death of his younger brother and the deep emotional scars it left. “It was a pretty rough life,” he said simply. After Ben and Andre entered the foster care system they bounced from home to home and from school to school, attending 12 in all. The foster care saga ended in 1992 with their adoption; Ben was 12 and Andre 9. The man who adopted them was Edwin Williams, himself a trailblazing UVA alumnus and a powerful role model. Edwin Williams was the second African-American to graduate from UVA’s College of Arts & Sciences. Ben Williams’ adoptive father Edwin is believed to be the first African-American member of UVA’s glee club. In this photo in Old Cabell Hall from the 1961-62 season, Edwin Williams is fourth from the left, second row. With the adoption came a move from Nevada to Seattle and another jarring shift in the brothers’ young lives. The senior Williams, who graduated in 1965 with a degree in chemistry, had high hopes for his new sons. “His adoption of us was with the intent of helping young men, and particularly two young men of color, to give them an opportunity to experience life in a different way than we were experiencing at that time,” Ben Williams said. It was a life lesson in giving back and helping others that Williams would hold on to – one that drives his work in D.C. today. But things did not go smoothly at first. Ben was admittedly headstrong and set in his ways. “My father had certain ambitions for me when he adopted me and I think we bumped heads a lot and struggled a lot because I had gone through so many different life experiences,” he said. For Andre, the trouble stemmed from his inability to control his impulses. That lack of control would later come to haunt Ben. Ben Williams said being principal at Ron Brown College Preparatory High School is the highlight of his career. He has heard positive stories about the school’s impact from parents and students alike. “We are doing something right,” he said. The trio moved to Washington, D.C. in 1994. Because of his father’s failing health, Ben moved in with his aunt in Newport News the following year. Andre’s behavior troubles dictated that he be placed in a facility, first in Washington, then in South Carolina and finally, one in nearby Portsmouth. For Ben, meanwhile, access to Virginia’s colleges and universities was the silver lining. Ben’s and Andre’s journeys during this chapter of their lives were very different. Ben’s time was filled with sports and trips to Charlottesville. A strong, skilled athlete, if he wasn’t visiting his cousin, Robert Hunt, who was a left tackle for the Cavalier football team, Ben was participating in UVA’s basketball camp, named for then-UVA basketball coach Jeff Jones. He dreamed of playing college basketball. During this period, Ben began thinking about college. “My senior year in high school, I kind of knew that UVA was going to be an option,” he said. And he was right; he applied and was accepted. Fiercely self-reliant, he simply did not know how to ask for support. Every time he went home to visit his aunt, Ben went to see Andre at the facility in Portsmouth. Andre was not allowed to leave the ward for overnight visits and Ben said it felt like his brother was in prison. The experience was deeply painful. Ben got through his first and second years at UVA and began to feel the wind at his back, comfortable that he was going to graduate – the Williams brothers were going to graduate. That optimism for a reunion and better times ahead, however, would not last. A few weeks before Ben’s third year at UVA, Andre was killed by a drunk driver while crossing a highway. He was 17. Ben was 20. “That almost derailed me,” Ben said in a low voice. “I did not know how to deal with that. I had been able to suppress and compartmentalize my feelings and my emotions up to that point. Abuse. Anything. Ben was numb. He felt responsible for Andre’s death. And then, Williams had a vision. And in that moment, Ben said he stopped crying and knew he needed to ask for help. His cousin lived with a local psychiatrist who had become a family friend. Ben asked if he would meet with him. “And Doc said, ‘Yes, we can meet at 7 o’clock on Sunday mornings,’” he said. They met for several weeks. “Doc just sat me down. He was just talking to me about all if it – about trauma – about how my experiences led up to that moment. I was blaming myself, but it was just a culmination of everything I had gone through and how it finally came out. I’d been suppressing it for so long. Two years later, he graduated from the College with a degree in foreign affairs. He returned to the Curry School of Education to earn a master’s degree in teaching in 2005 and completed his doctorate in education and administration 10 years later. Williams walked the Lawn to collect all three of his degrees. The emotions were different each time. Ben Williams celebrates earning his doctorate from the Curry School of Education in 2015 with his father, Edwin S. Williams, and his aunt, Elva Hunt. 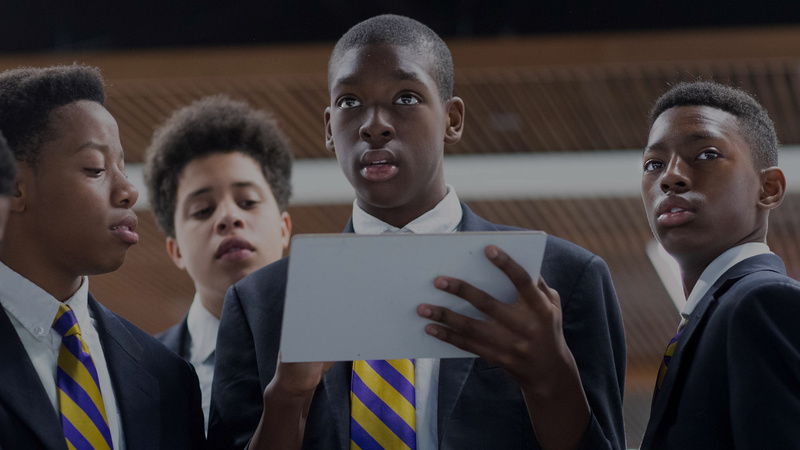 In August, the District of Columbia Public Schools opened the doors of Ron Brown College Preparatory High School to 100 ninth-grade young men. Williams is the founding principal of the gleaming school, built in 1930 and undergoing a $58 million renovation. The D.C. system said the 48 percent graduation rate of African-American and Latino males mandated they address the problem directly, and the school, which is just off the Anacostia Freeway in Deanwood, was established. The current class is mostly African-American; a new ninth-grade class will be added over each of the next three years to complete the Ron Brown School’s transition to a four-year institution. Before the inaugural school year began, a tailor visited the school and fitted each young man for a uniform, which consists of a white, button-down, Oxford-cloth shirt, a blue blazer, tie and khaki pants. Williams said most of the young men had never had that type of experience, and it punctuated their significant transition from middle to high school. The “circle” is actually a rectangle of chairs in a large central room, sparse but for posters of Langston Hughes, Carter G. Woodson, Frederick Douglass and Thurgood Marshall. As the minutes pass, the room gradually fills. In addition to “shout-outs,” the half-hour serves as a buffer, allowing students to get to their first-period classes on time. The school, named for President Bill Clinton’s African-American commerce secretary, who died in a plane crash in 1996, has an 83 percent daily attendance rate, among the highest in the district. The school’s slogan is “We are all in,” and that is set in motion each day at morning circle. Williams said 15-year-old Zion Matthews has made one of the greatest transformations since school began. “His prior school years, he was in multiple fights. There were multiple suspensions. He wasn’t as interested in being a student. He just showed up because he knew he had to go to school,” he said. Matthews continued that behavior at Ron Brown for about four months. Sitting in the office of the principal – whom students refer to as “Doc” – Matthews confessed he would bait the faculty and staff because he wanted to get kicked out of school. “But Doc wasn’t going for it, so I just gave up on it,” he said with a shrug. The staff wasn’t going for it either. “It was just like the environment, the love they show even after all the disrespect that I showed them. They really showed me that they actually cared about me and my education,” Matthews said. Williams listens in his office as student Zion Matthews describes how the new school has had a positive influence on his life. Williams said Matthews is now one of his top students. As Matthews stood up to return to class, Williams called out to him. “Remind me to get you a new jacket,” he said. “Your arms are getting longer.” Ron Brown’s inaugural class has three more years before graduation. Williams’ goal is to exceed a 90 percent graduation rate. But statistics alone can’t tell the whole story. “Many people are going to view the success of our school based on our end-of-year numbers,” he said. “What we can’t quantify is the testimonial that you just heard from Zion. Williams said he sees his brother, Andre, in students like Zion. And the young men see themselves in their principal, too, because he has shared his story with them. “They believe us when we look them in the eye and we say, ‘We have you. We’re going to help you and you’re going to do it,’” he said. The curriculum at Ron Brown includes college visits. This year, the focus has been on historically black colleges and universities like Morehouse College and Clark Atlanta University. The goal is to show the young men that college is a viable option and to show them college students who look like them. Next year, Principal Ben Williams will bring his 10th-graders to the University of Virginia. The thought brings a slight smile to his face. “I am excited to show them the Grounds,” he said.